Villa in Caleta de Fuste, Fuerteventura - Peaceful Cul De Sac Location, and Easy Walk To The Beach, and Atlantico Commercial Centre. 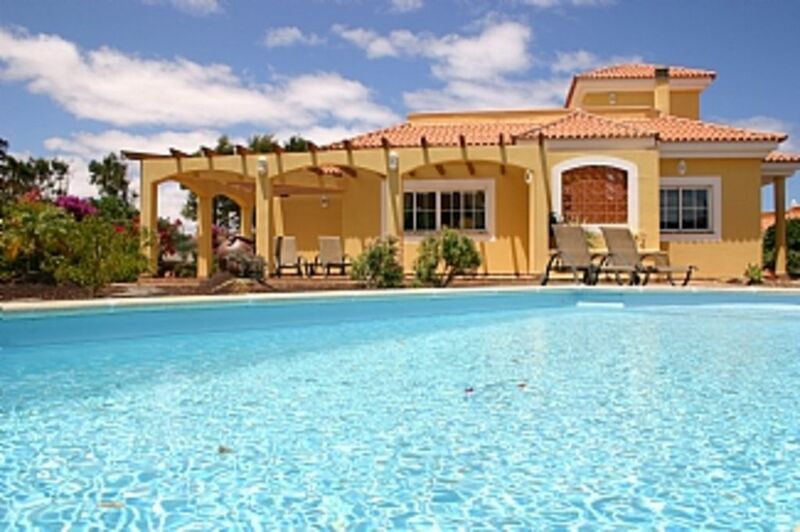 This spacious front line golf villa is located in the Fuerteventura Golf Resort, Caleta de Fuste and the nearest beach is only a 10/15 minute walk away, along with the Atlantico Commercial Centre that has a wide range of shops, restaurants, arcades, cinema, bowling alley, casino and bars for you to enjoy. The golf course and 5 star hotel & club house are nearby and include an excellent restaurant. The villa itself benefits from several sun terraces, and is set in pretty landscaped gardens, new for 2018 Artificial grassed area. There is a large private pool with roman style steps in sunny south facing aspect to compliment the villa that is stylishly furnished to a extremely high standard throughout and is equipped with every modern convenience to make your stay as comfortable as possible. The living room has 2 giant over sized sofas and Includes large screen TV with UK TV channels, BBC1, ITV ect, DVD Player & large selection of DVD's. Ample car parking outside the villa. Covered courtyard feature that includes a secluded barbecue and enclosed dining area. The property is all on one level, with 3 generously sized bedrooms, and 3 bathrooms. Wifi is available, local charges apply. As the airport is located only 15km away this is the ideal base to relax and enjoy all that the island has to offer. One of just a few 'luxury'sized villas with sunny south facing pool area in a large plot. toilet, shower, bidet, Large walk in Shower. En-suite to master bedroom with jacuzzi style bath with shower over, wc & double basins. Bathroom 1 with bath/shower over, single basin and wc. Bathroom 2 with half size bath with shower over, single basin & wc. Ample on street parking available, outside the villa. Local Charges apply, from 20 Euros for 1 week. Payable directly to internet provider. The kitchen has a full range of modern appliances and utensils such as full oven / grill, 4 ring hob, fridge/freezer, dishwasher, washing machine and microwave. There is a full supply of glassware and crockery. Breakfast table & chairs. Iron & Board. There are several large tables/chairs for inside & Al Fresco dining options. UK Channels, Including BBC and ITV. Selection of DVD's for guests to use. Several sun terrace areas, and internal patio. The villa is situated in the Fuerteventura Golf Resort, Caleta de Fuste, with an exclusive 5 Star hotel with clubhouse, driving range and practice putting green, everything you need is right on your doorstep. It is a championship 18 hole par 71 course and was home to the Spanish open in 2004. Adjacent is the Las Salinas de Antigua Course which is a 18 hole par 70, suitable for both men and women. It is formed by hills and dunes which naturally protect from the challenging winds. 8m x 4m Excluding steps. Heating included in Winter months, supplement payable during other times. Notes on accommodation: Pool heating is included in the rental rate (electric heater in winter months, solar cover year round). Air-conditioning, in all 3 bedrooms & living room, is available at a extra charge of £125 per week. Due to the facilities offered this property is not suitable for small children under the age of 5. We request that smokers do not smoke within the villa and use the outside area for this only. Car hire would be recommended to get out and about to explore & experience the island, but is not essential. We do not accept any liability for any loss or injury to you or members of your party during your stay. Outside: The detached villa is set in a large plot with several patio areas all set in established landscaped gardens. There is a large outdoor swimming pool which is cleaned twice weekly by a professional pool cleaner. The pool (heated in winter) is south facing and catches the sunshine from early morning until late in the evening. There is also an internal courtyard feature with BBQ. Utility Room: Washing Machine Cleaning / Towels / Linen / Maid service: The villa will be cleaned prior to your arrival. Bed linen & Bath towels are provided. For guests staying 10 nights or more a laundry change will be done halfway through your stay. The pool will be cleaned twice per week, by a professional pool cleaner. Other: There is a secluded internal patio area, ideal for alfresco dining. Several patios, 6 sun loungers. Many Thanks for taking the time to review the villa. Lovely villa in great location. Fab view of golf course. Lovely spacious home in a quiet well kept cul-de-sac. Rooms are large, airy and bright. Kitchen has all modern conveniences. Lounge has 2 spacious settees. AstroTurf area beside pool is very comfortable. It's right beside golf course but has a very private feel. Villa is about 20 minute walk from Atlantico shopping centre, through bright, well maintained streets. We stayed here the same time last year, such a lovely villa, really homely. They have everything you could need. Very much improved by the artificial grass by the pool, which is lovely. Thank you for taking time to review the villa. Really lovely Villa, one of the best we have stayed at. Pool was nice and warm and cleaned regularly. The photos of the Villa don't do it justice. 20 minute walk to the town centre made it ideal to walk in and the get a taxi back. Could not fault the accommodation beds were nice and comfortable. The Villa agent was very helpful and made us feel very welcome. Fuerteventura is home to some of the best white sandy beaches in the world. In Caleta de Fuste there are 2 main beach areas, the main resort is just a 5 min drive away. Here there are a host of attractions including boat trips, windsurfing, and diving. The second beach is in front of the Atlantico commercial centre and 5 star Sheraton Hotel. Along the coast line you will find a host of other activities including kite surfing, or a small cove just to explore and relax or enjoy a coastal stroll. Airport 15 minute drive. 15 euros (approx) in a taxi. Car hire is widely available and is recommended. Resort Centre of Caleta de Fuste 1km. Capital Puerto del Rosario 15km. Airport 10km. Caleta de Fuste is centrally located and just a short drive from the airport, making it a perfect destination for an enjoyable holiday for families and couples. Easy to access resorts such as Corralejo and El Cotillo in the north which are accessible by local bus, and Costa Calma and Jandia in the south where you would need to drive by car. You will find a host of activities on the island, with quad bikes, trikes, go carting, a host of water sports available locally. There is also a large zoo and camel safari in the village of La Lajita a great hit with all the family, and water park in Corralejo for those more adventurous. If you want to visit more than one island on your holiday, then hop over to the island of Lanzarote that is easily accessible by regular ferry boat. Changeover Day: Flexible changeover days. Access to the villa is normally after 4pm and departure before 10am, however times may be flexible by prior arrangement. Notes on prices: Prices are for the property per week in £'s Sterling, based on up to 4 people sharing. For bookings of 5 guests or more an additional charges are applicable. Pool heating is included ( Mid October to Mid May). Air-conditioning is available at a cost of £125 per week.